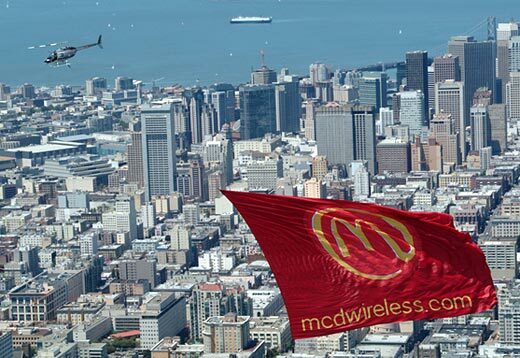 Commonly referred to as a helicopter banner, AirSign's Heli-Banner® offers clients the ability to promote their product or brand on the world's largest Aerial Billboard Display. 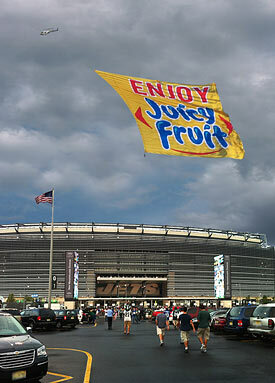 Heli-Banners® range in size from 10,000 sq. ft. all the way to 50,000 sq. ft. If you are looking for a head turning, show stopping campaign that will generate a buzz - captivating entire cities - then the Heli-Banner® is the way to go. Helicopter advertising banners offer state-of-the-art digital artwork capabilities, allowing high resolution designs and giving excellent clarity to the viewers. Perfect for maximum exposure and branding, Heli-Banners® deliver both a mega media blitz and higher ad recall rates than any other aerial banner. Typically when AirSign starts a new Heli-Banner® campaign, social media outlets like Facebook and Twitter instantly go crazy sharing the experience - which aids in the buzz. Heli-Banners® can target demographically and geographically at the local, regional, and national levels and work perfect for single or multi-market campaigns. 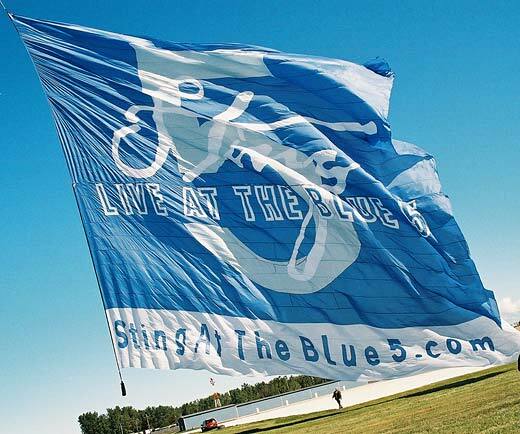 Heli-Banners® work great for targeting traffic, beaches, sporting events, and major outdoor events like NASCAR, NCAA and NFL football games, baseball games, grand openings and much more. If you're looking to bring major attention to your media, then the AirSign team is equipped to create and manage a Heli-Banner® campaign that will exceed your expectations! See the guy standing under the banner? These things are huge! What Makes Heli-Banners So Effective? There is something about a helicopter flying overhead that demands our attention. They have a unique sound, and the rarity of their appearance also makes them special. Now imagine, as people look up, they see, flowing behind the helicopter, a Heli-Banner® displaying your company name, logo or message! Suddenly the attention is focused on your message. Helicopter advertising involves helicopters towing massive banner ads. 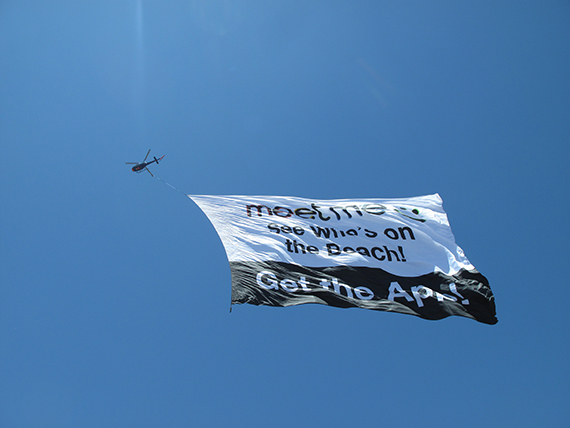 The message is suspended below the helicopter as it flies over a sporting event, beach, fair, or other large gathering. 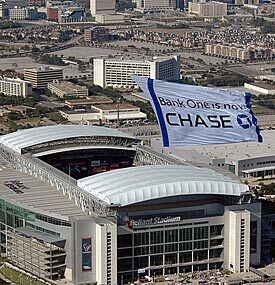 Helicopter banners are the biggest banners in aerial advertising – up to twenty stories tall displaying a message that's almost the size of an entire football field. That's 30,000 to 50,000 square feet! Banners are pulled behind the helicopter and the people below, hearing the sound of the copter blades, will have plenty of time to read it each time it passes – making it very memorable. What Makes Helicopter Advertising So Effective? Helicopters have the advantage of flying more slowly than planes, providing a longer viewing time. Because of their upward lift, helicopters are able to pull several times the weight that single engine planes can pull. This means a larger banner and more extensive message can be displayed. This, coupled with the slower speed and multiple passes can add up to a great impact on your audience. Heli-Banners enjoy another big advantage over standard outdoor advertising such as highway billboards, balloons or signs. 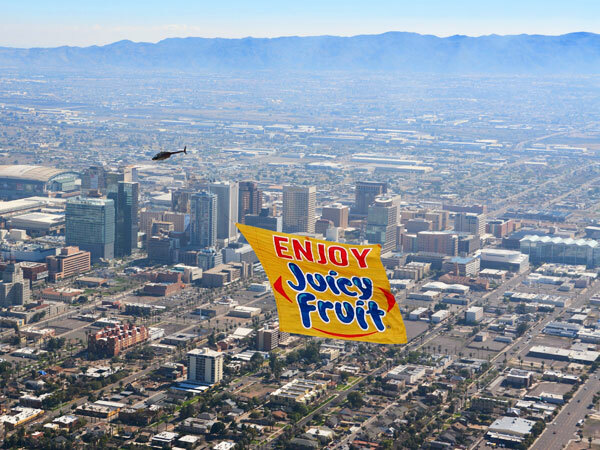 Advertising in the sky has no competition for attention. The wide-open sky is empty of messages until yours grabs people's attention with the audio (our helicopter) and visual impact (your Heli-Banner). And the multiple passes will virtually guarantee that your company's message will be indelibly etched in their minds. 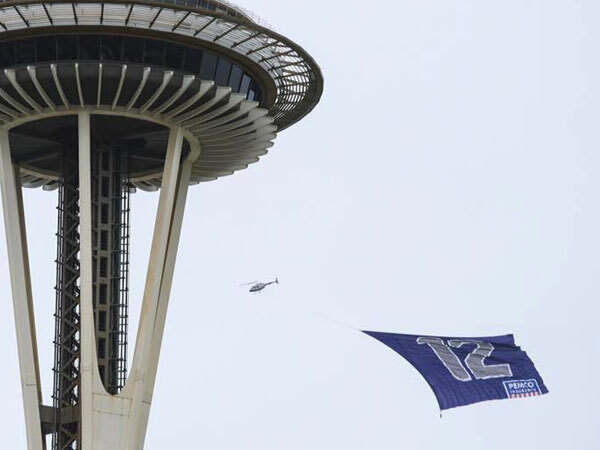 How Could You Use A Helicopter Banner? People have used helicopters to advertise a company, promote a unique product, draw attention to a special event, congratulate someone on a job well done, and even to propose marriage! Because of the uniqueness of this form of advertising, your message is sure to make a lasting impression on your target audience.